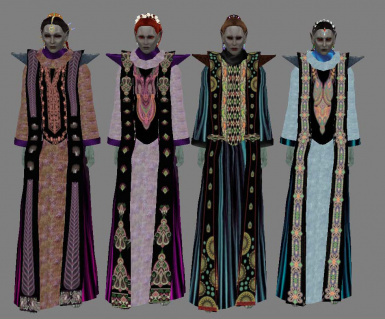 NPCs with class "Noble" in original MW and in Tamriel Rebuilt are now wearing new robes as well as various shiny, expensive looking things: new House-specific hairstyles, veils and earrings for women, circlets, scarves and piercing for men. v2 - Many bugs fixed. 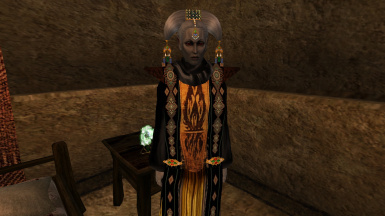 - Reflection effect on robes reworked to look more natural. 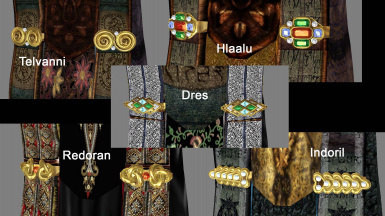 - Detail maps added to all gems (on robes, hairstyles, earrings and circlets). 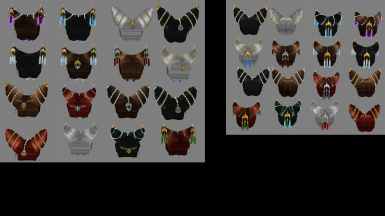 - Gems glow value lowered. 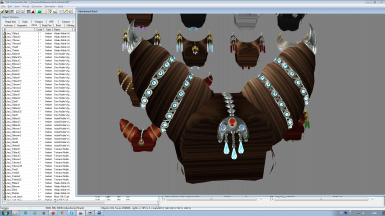 - Piercing and circlets textures changed. 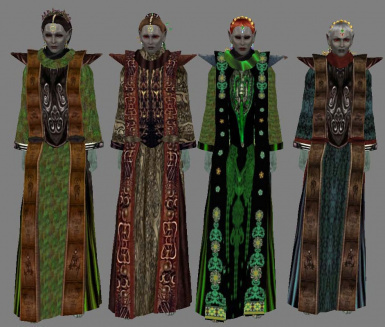 v1.5 - Critical bug (missing gloss maps for robes) fixed. (Thanks Morthrug for uploading screenshots where I saw this issue!) PLEASE RE-DOWNLOAD!!! v1.2 - Unnecessary TR dependency removed from one of the files. 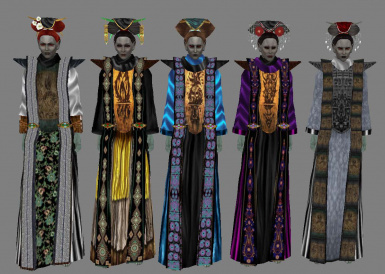 This mod adds 100 new playable hairstyles for Dunmer noblewomen (16 for Hlaalu, Redoran, Telvanni and Indoril, 17 for Dres and 19 for noblewomen not belonging to any House) and 30 new robes (4 for each House except Dres, 5 for Dres, 4 for Vvardenfell and 4 for the Mainland). 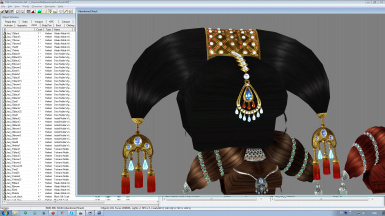 Hairstyles are for MacKom's heads. 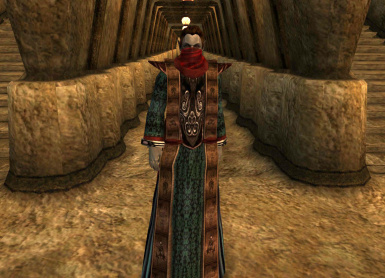 - circlets, armored House robes, scarves and piercing for men. I've also made an addon which adds randomly generated nobles to some appropriate location in vanilla MW (only indoors - to avoid fps hit) - just as an eye-candy and to showcase new items. 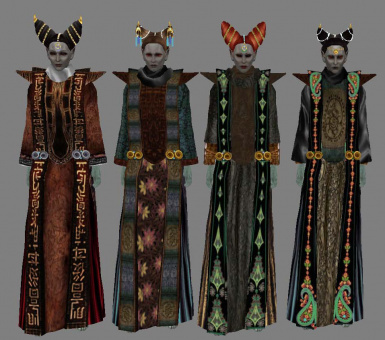 Spawn points are set in Vivec cantons, Vivec Temple, Ebonheart keep, Hlaalu, Redoran, Telvanni council houses, Mournhold Temple and Godsreach. 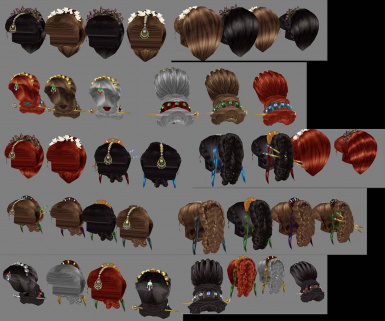 Hairstyles are also made into wigs. All new stuff is added to leveled lists so you have a chance to stumble upon it in game. 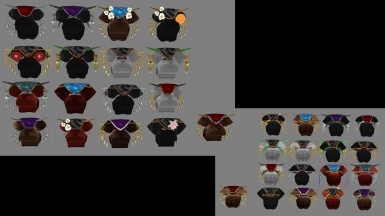 for random items to spawn. 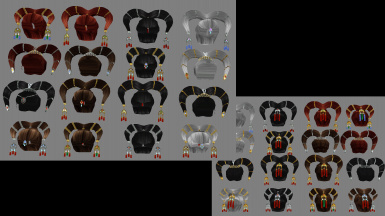 If someone decides to add ears and thus make hairstyles compatible with older heads meshes - feel free to do so. 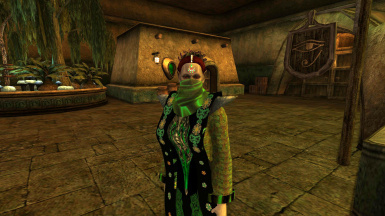 WARNING: if you have already seen a NPC during the current playthrough, the game "remembers" their clothes, so, when modified by a mod, only their hairstyle and face will change. 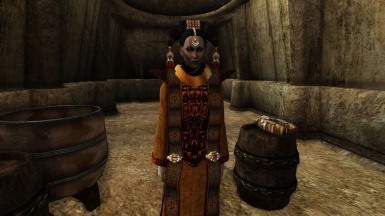 In order to see changes to NPCs equipment you should either delete the info about particular NPCs from your save file (by TESAME or Enchanted Editor or other similar utility), or start a new playthrough. 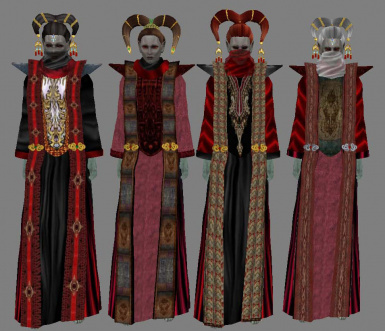 MacKom's Dunmer Heads (and hairstyles adapted for them.) 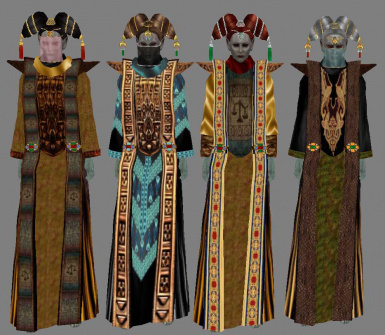 http://www.nexusmods.com/morrowind/mods/43234/? 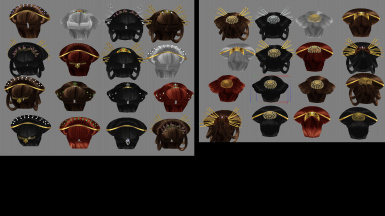 TR Heads Replacer (MacKom's heads) - for Tamriel Rebuilt users http://www.nexusmods.com/morrowind/mods/43806/? 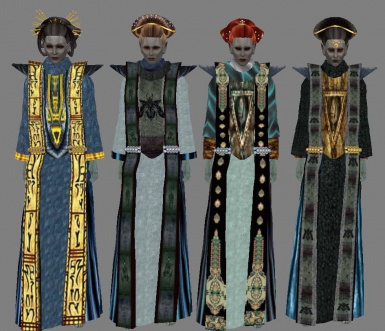 The Great Houses robes have reflection mapped details so in order for them to be displayed correctly you need Morrowind Code Patch. 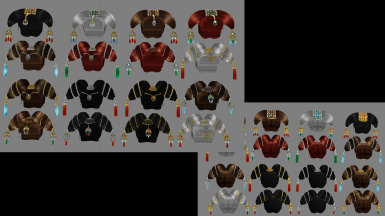 Optional files DNO_Hairstyles.ESP and DNO_Robes&Scarves.ESP contain only hairstyles and robes&scarves respectively. YOU DON'T NEED THEM TO PLAY THIS PLUGIN.